Shepherd Neame Brewery Store in Faversham played host to a great evening on June 7th, to recognise the work of volunteers in Kent. From all the nominations received, the awards committee picked three finalists from each category, who they felt had made a significant contribution to their rugby clubs. The winners and runners-up were presented their awards on the evening by one of our own referees, Laura Pettingale. Laura spoke about her referee journey, starting out as a young referee at the age of 17, as a volunteer herself, refereeing games at numerous rugby clubs in the county. 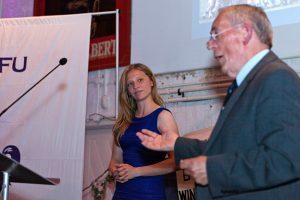 She has now reached the heights of the Women’s International arena and was asked to be the guest speaker at the Kent Volunteers award evening. Laura said, ‘I am indebted to the volunteers working within Kent Referees Society who supported me. I wouldn’t have achieved so much without their support.’ On the evening David Clent, Kent County Game Development Chair awarded Laura with County Honours on refereeing her first County Championship, Senior Men’s game this season. As a Society, we are looking to increase the numbers of our female refereeing members and would encourage women and girls to give it a go. Referee courses are beginning again in September and will be advertised on our ‘Become a Referee’ page when the booking link opens. Summer Fitness Training has started Bill Huntley – Referee in the spotlight!